I don't know about all of you but I sure have enjoyed the discussion and pictures of the Cassin's Grape Brandy Bitters that has been featured on the site the last week or so. It sure would be nice to see a post on the history, digging stories or an account of the amount of known Cassin's in collections. This rare bottle has some interesting stories to be told. Anyone want to step up to the plate on this one. Of the Cassin's I have owned, one was dug in San Jose (variant 1), another was dug in Ione (variant 1), another was found in Truckee (variant 1), another was dug in San Francisco (variant 2), and another was dug in Dayton, Nv (variant 1). That is interesting. In my book I show that the Cassin's Grape Brandy Bitters product was advertised in the Portland Morning Oregonian newspaper with the Hildburgh Bros. as agents for Portland. The advertisement ran March 1868. I believe the Portland find was a green variant 2 discovered inside a piano shipped from San Francisco in the 1870s. Interestingly enough there’s a French perfume bottle made in the same time period that closely resembles the Cassin’s shape. Virtually mint (tiny base flake) Var. 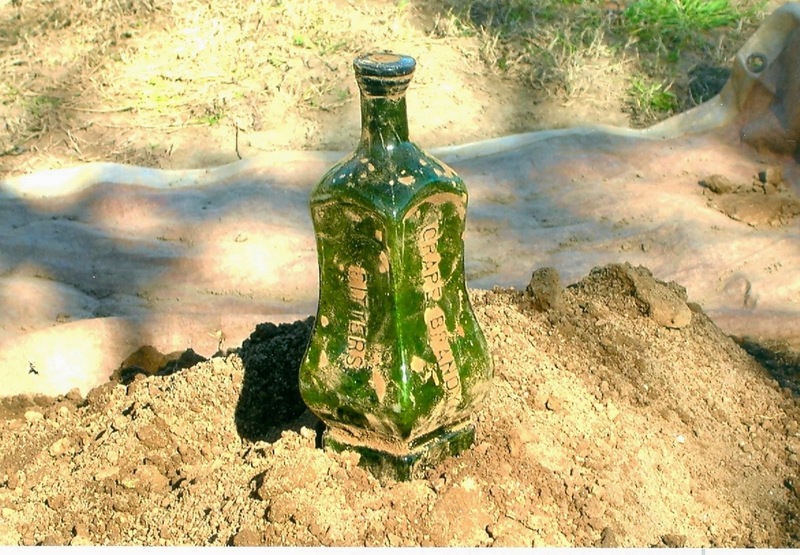 2 green Cassins I once owned(Ex.- Elmer Smith ) was, according to Mike Henness, a dug or surface-found bottle. Anyone know the story? I believe that example came from Sonora as the first poster listed. The Sonora example listed at the top has a hole put in it by the finders probe. Sounds like Froggy had a different example. so two were found in Sonora ? That's correct Dale. It now resides in a Nevada City collection. The color appears a bright lime color because the bottle is full of dirt, after a cleaning the true color was the same as your former example. It is my understanding this bottle was heavily damaged.